Can This Men's Shaving Product Improve Your Beauty Routine? This tip is something I saw first on Jaclyn Hills YouTube channel and I had to try it straight away. I was lucky as Thom actually uses this product for its normal purpose, so didn't have to go out and buy it to see if it works. This men's shaving product is the best MAKEUP PRIMER I have ever used. That's right you can use this every day men's product to help your makeup stay put all day long. I was dubious about using this at first as I do have really sensitive skin and have recently been having an issue with Rosacea, so I didn't want anything to irritate it or cause more breakouts. 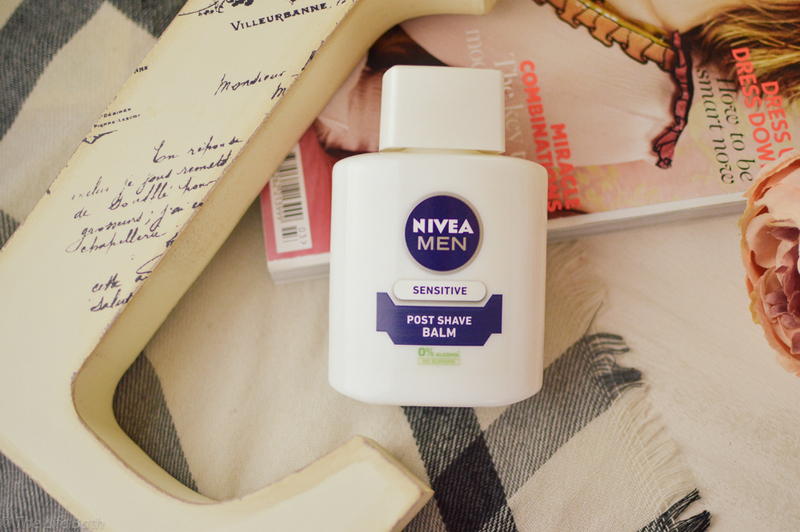 Nivea does 2 types of post shave balm and both work as primers, but luckily Thom uses the sensitive one which I think is best for my skin. You don't have to worry you won't be smelling like a man all day as it doesn't smell really strong, although it does have a slight aftershave manly smell this won't stay on your skin. It is quite a thin liquid and you don't need a lot at all. you just use it as you would any other primer, you just rub it in until it becomes tacky. The science reasoning behind why this product works it that it contain glycerine, which is used in personal care products at it provides a smooth surface and that is what makes the makeup stick to your skin. Not a great technical explanation but all you need to know is that it really does work. I tested it on a work day as this is when I am most busy and don't have time to retouch makeup. I usually rush my makeup for work as I am not a morning person at all and love to stay in bed as long as I can, this means I never have time for primer and at the end of the day my makeup hasn't lasted much at all. When I first used this I spent the time and did a full makeup routine like a would on a weekend. I checked at lunch time and all was good still looked nice and didn't feel like I needed to touch up, and then checked again when I got home and even though I was a little bit oily which is just my skin in general no matter what I use, my makeup was still in place. Since then I have used it quite a lot and I absolutely love it. I have a few primers I love but they are all high-end so not the cheapest, that's why this is even better as because it is made for men you get a lot in the bottle and it is really cheap. I got a second bottle just for me, so I wasn't stealing Thom's all the time, and it only cost £5.35 from Boots. Get out there and start rummaging in your man's bathroom cabinet and see if this is lurking in there. Please let me know in the comments below if you have tried this, and what is the strangest non-beauty item you have discovered works well in your routine?